Water storage – wetlands act as a sponge to absorb water during floods and slowly release the water back during droughts. They also slow down the water’s momentum and decrease erosion. Water filtration – wetlands allow pollutants like sediments and nutrients to be absorbed or settle to improve water quality. Habitat and nurseries– wetlands are diverse ecosystems that are home to a wide variety of plants and animals. Reduction of mosquito populations – a healthy, functioning wetland can actually reduce mosquito populations by providing proper habitat for the natural enemies of mosquitos and by preventing or reducing flooding. What can you do to preserve Wetlands? Learning about the wetlands and the surrounding watershed in your area. Informing neighbors, developers, and state and local governments about the important role wetlands play. Maintaining wetlands and adjacent buffer strips as open space. Planting native vegetation on your property and removing invasive species. 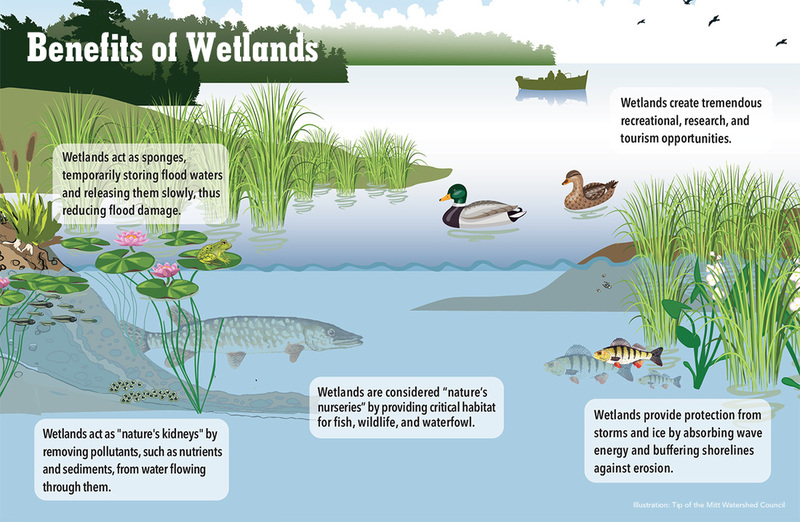 To learn more about wetlands visit https://www.epa.gov/wetlands.